WA1000B GENERAL PURPOSE CRYO CONSOLE SYSTEM WITH BLANK CONSOLE, BASE AND LL100 MULTI-TIP FREEZER. The WA1000B console offers the ideal combination of easy-to-use controls and built in safety features. It uses the powerful LL100 two-trigger freezer. Freeze and defrost only occur when triggered and can be stopped instantly. A console-mounted switch must be activitated to permit gas to flow into the LL100 and a color-coded gauge provides gas pressure reading at a glance. 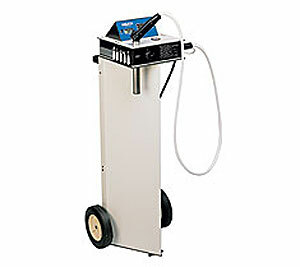 The Temperature Indicator gives surgeons unparalleled control and efficiency during cryosurgery. 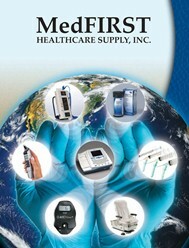 In addition, a removable stainless steel well holds the cryotip and stem and may be used as a disinfecting receptacle. A large selection of stainless steel reusable sterilizable cryotips and disposable plastic shields are available. Ultimate in safety and convenience. Each tips is supplied with 5 single-use, disposable plastic shields. Remove disposable shield from cryotip and discard after each use (shields insulate the tip and assure proper attachment). 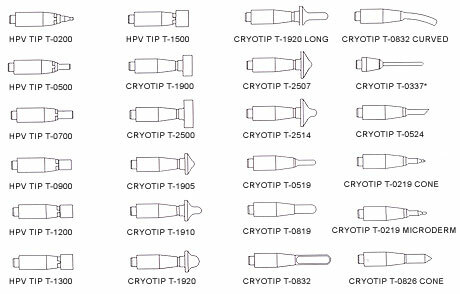 Cryotip is fully sterilizable to prevent cross-contamination (autoclave or ETO).